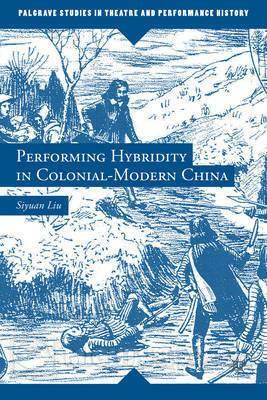 Performing Hybridity in Colonial-Modern China.New York: Palgrave MacMillan, 2013. 260 pp. Performing Hybridity in Colonial-Modern China fills a crucial gap in studies of modern Chinese theater by providing an in-depth study of the genre of wenmingxi (civilized drama). The dominant new theater form of the 1910s, wenmingxi has been largely passed over by scholars both inside and outside China, in favor of a constructed history of huaju (spoken drama) that begins with either the 1907 adaptation of Uncle Tom’s Cabin entitled Black Slave’s Cry to Heaven or Hu Shi’s 1921 one-act play The Greatest Event in Life. In both Chinese-language and English-language scholarship, the earliest modern Chinese theater productions have been written about almost mythically, following the oft-expressed belief that no materials from these productions are extant. By combing Japanese archives, Liu has found documents and photographs that form missing link after missing link in reconstructing previously lost narratives. In so doing, he shows how crucial it is for scholars of modern Chinese theater to utilize Japanese materials. Liu answers questions about productions of Chinese theater that cannot be studied through Chinese sources alone. Liu’s analysis is organized into an introduction, six chapters, and a brief but crucial epilogue. In “Introduction: Modernity, Interculturalism, and Hybridity,” he posits both theoretical and historical reasons why hybrid theater forms like wenmingxi have been excluded from the histories of modern East Asian drama. Wenmingxi is not the only neglected hybrid; sharing its fate is a Japanese form called shinpa (new school drama), a hybrid of kabuki and Western spoken theater that also influenced wenmingxi. According to Liu, scholars have ignored these hybrid forms because they do not fit into the binary traditional/modern model that currently dominates non-Western theater studies and performance studies. Nor do hybrid theater forms fit into current discourses on intercultural theater, discourses that theorize interculturalism as the exchange between two distinct theatrical cultures. Liu also considers postcolonial studies’ use of hybridity to be a mismatch with wenmingxi, given that China was never truly colonized by the West; instead, Liu prefers the theoretical frame of colonial modernity, a term he uses in his book’s title. Toward the end of the introduction, Liu demonstrates, in a span of two paragraphs, how huaju leaders Hong Shen, Tian Han, and Ouyang Yuqian wrotewenmingxi out of the history of modern Chinese drama. Liu handily debunks a number of huaju myths: for example, the term huaju itself was coined not by Hong Shen in 1928, as is the “common belief,” but had already been used by Chen Dabei in 1922 (8). Liu concludes his introduction by outlining his six chapters within an interdisciplinary theory of hybridity drawing on biology. Chapter 1, “Emergence of a National Theatrical Discourse,” sets the stage for the three-way interplay between China, the West, and Japan, with the latter as a frequent cultural conduit between the other two. Liu begins by analyzing how the myth of the Paris Opéra evolved in the writings of Chinese diplomats and other visitors to the West during the late Qing Dynasty. They portrayed the Paris Opéra, built after France’s defeat in the Franco-Prussian War, as inspiring national recovery through theater. Initially, the myth did not take hold in China; only after the Japanese successfully utilized that same myth to build a national dramatic form, and, not insignificantly, defeated China militarily, did Chinese leaders decide to reconsider the power of a new kind of theater to inspire the nation. In this chapter, Japanese shinpa makes its first detailed appearance, as does its key practitioner Kawakami Otojiro, who staged a shinpa about the Sino-Japanese War while the war was in progress. Throughout this chapter, Liu employs his signature move of using careful readings against multiple sources to challenge the truth in what the chroniclers and practitioners of the day wrote. In reading the chronicles of early Chinese diplomatic missions to Europe, he notes the historical inaccuracies in the chroniclers’ accounts and analyzes what those inaccuracies reveal about the authors’ motivations. Liu likewise notes that Kawakami’s vision of the Sino-Japanese War was actually adapted from two French plays Kawakami had seen in Paris. As he does throughout the book, Liu draws on Chinese, Japanese, and Western language sources to make his arguments. Chapter 2, “Hybrid Sources: Western, Japanese, and Chinese” furthers Liu’s use of all three types of sources and reinforces how essential that trio of influences was on the future wenmingxiartists. In this chapter, Liu looks at different forms of Western-style theater visible in Shanghai from the mid-nineteenth century on that influenced the later wenmingxi. Examples include amateur expatriate productions in the international settlement and travelling companies from Western nations like Australia, as well as travelling companies from Japan presenting shinpa productions primarily for Japanese residents of Shanghai. Another source was student productions at church-run schools and universities with primarily Chinese students. While amateurish, these productions gave many Chinese spectators their first view of Western spoken theater, including future wenmingxi acting star Wang Youyou. The productions also served as training grounds for some of the future leaders of wenmingxi, such as Spring Willow Society co-founder Li Shutong. Liu then gives a detailed discussion of the Spring Willow Society’s repertoire. Though this troupe’s performance of the landmark 1907 Black Slave’s Cry to Heaven is widely referenced in Chinese and English studies of huaju, Liu analyzes four different Spring Willow Society productions: La Dame aux Camelias, Black Slave’s Cry to Heaven, Cry of Injustice, and La Tosca. The lack of an extant script, an oft-cited reason for not being able to analyze Black Slave’s Cry to Heaven, does not deter Liu, who uses production photos and the promotional poster, which includes a synopsis for each act—one of many sources Liu found in Waseda University’s Tsubouchi Shoyo Theater Museum collection. In his analyses, Liu demonstrates how the source materials for each story were altered to promote nationalist goals. He also addresses the training and skill levels of the troupe’s members, several of whom, such as Ouyang Yuqian and Lu Jingruo, make frequent appearances in Liu’s book. Chapter 3, “Hybridization in Shanghai,” brings wenmingxi itself to the forefront. Liu looks at two stages of the form’s development: first, the period from 1907 to 1913, when wenmingxi was revolutionary in theme but had little commercial success; and then the years after mid-1913, when tapping the power of domestic melodrama brought commercial success. This chapter also discusses the work of key players in Chinese theater of the era. For example, Wang Zhongsheng, inspired by the success of the Spring Willow Society, staged his own version of Black Slave’s Cry to Heaven in 1907, fully scripted by Xu Xiaotian, in the Western-style Lyceum Theater. By using the Lyceum, Wang introduced the proscenium stage and theater techniques to Chinese audiences. In 1910 and 1911, Lu Jingruo staged three Chinese adaptions of Japanese shinpa plays, one of which, The Bondman, Liu discusses in the chapter. Though critically acclaimed, and drawing on theatrical spectacle from Western, Chinese, and Japanese origins, the production did raise concerns that it was too lofty for the common taste. Liu also discusses the influence of Ren Tianzhi, who had spent more time in Japan than any other major figure in wenmingxi, and who formed the Evolutionary Troupe in 1910. This professional company performed in various locations in southern China, staging plays with revolutionary themes that repeatedly drew in audiences. With its actors later becoming core members of other wenmingxi troupes in Shanghai, the Evolutionary Troupe was influential on later acting and production styles, and Liu attributes three conventions in particular to its influence: using scenarios more than complete scripts, creating role categories to facilitate improvisation, and maintaining action by using scenes in front of the curtain while sets were changed behind it. Chapter 3—the book’s lengthiest—then moves on to the “1914 Revival,” a high point catalyzed by the commercial success of An Evil Family, staged by Zheng Zhengqiu’s New People Society (71). This production demonstrated the power of melodrama to bring audiences to wenmingxi. Just as the most successful shinpa had borrowed themes of domestic melodrama from kabuki, so, too, did wenmingxi borrow those themes from jingju (Beijing opera). Liu points out that during this high point of wenmingxi, most, though not all, productions in this period were based on scenarios, a topic he addresses in detail in chapter 4. In addition to the New People’s Society, Liu looks at other companies, including the People’s Voice, the Spring Willow Theater, and the Enlightened Society; the last of these added a further intercultural dimension by touring Japan, the source country of the shinpa so influential on wenmingxi. Liu then moves from the melodramatic back to the nationalist, showing how wenmingxi responded thematically to the changes in the political environment after Japan’s presenting of the Twenty-One Demands in 1915. Replete with details of artists, troupes, and productions, chapter 3 lays the historical groundwork for the next three chapters, each of which further examines a portion of the wenmingxi repertoire through one specific lens. In chapter 4, “Literary Hybridity: Scripts and Scenarios,” focuses on the script vs. scenario debate. Though huaju practitioners and historians have presented the fully-scripted nature of that genre as its defining accomplishment, Liu highlights several factors supporting his argument that, whether looking at the talent involved or the performance results, the scenario-based plays used inwenmingxi were by no means inferior to the script-based huaju plays. Given that audiences in the 1910s often came to the same theater on repeated nights, troupes needed to vary repertoire daily, and scenarios were better able to accommodate this need. When the same actors used the same scenarios repeatedly, many scenarios evolved into nearly-scripted plays that were performed almost identically each time. Liu also notes that even in the era of scenarios, there were some true scripts. A highlight of this chapter is Liu’s literary analysis of some wenmingxi. First, he compares two different versions of the play Orchid of the Hollow Valley: a 1914 thirty-scene scenario and a seven-act scripted version, the latter a reconstruction based on a retelling by former wenmingxi actor Fang Yiye in 1959. Liu’s analysis reveals how scenario-based theater was, in a sense, a form of “collective playwriting” (114). Then, while underscoring that the scenario/wenmingxi vs. script/huaju camps were not so clear-cut, Liu analyzes one of the extant individually-scripted wenmingxi plays, Lu Jingruo’s Family Love and Grievance. Chapter 5, “Translative Hybridity: Acculturation and Foreignization,” examines the issue of adaptation (“acculturation”) vs. translation (“foreignization”). Liu explains how adaptation was better suited to the world of wenmingxi, as Chinese audiences might find it challenging to embrace unfamiliar cultural references. For example, ending a play with multiple suicides was a familiar device for Japanese audiences, but Chinese audiences more accustomed to happy endings were jarred by the suicides. Adaptation was not limited to culture and content; Liu also shows howwenmingxi drew on local performance conventions from jingju, just as shinpa in Japan had drawn on kabuki performance conventions. An example comes from productions of La Tosca in both Japan and China. The torture scene, performed offstage in the European original, was moved onstage in both Asian versions, as the traditional theaters in China and Japan did not have a convention of hiding violence offstage. In this section of the chapter, an intriguing archival moment comes when Liu compares notably similar production photos of the Japanese and Chinese versions of La Tosca. Continuing to look at adaptations of Western classics, Liu analyzes how differences in national identity led to different adaptations of Othello in Japan by the husband-wifeshinpa team of Kawakami Otojiro and Sadayakko and in China by wenmingxi playwright Lu Jingruo. Liu then removes Europe from the equation and discusses two of Lu Jingruo’s adaptations of Japanese shinpa plays. Chapter 6, “Performance Hybridity: Searching for Conventions,” examines three different aspects of performance in wenmingxi. The first is the genre’s lack of established performance conventions in comparison to jingju, in which each movement was codified. Liu examines the theoretical writings of Spring Willow Theatre member Feng Shulan, who put forth several “theorems” outlining what wenmingxi actors should and should not do (147). The second aspect Liu discusses is the use of songs. Determined to separate itself from the operatic jingju, the newwenmingxi originally eschewed the use of songs. However, audience interest in songs won out, as it also had in the Japanese shinpa. The integration of songs into wenmingxi performance was hardly seamless, and the songs were used more to engage audience interest than to heighten emotion. The final aspect Liu discusses in chapter 6 is gender, particularly female impersonation by male actors, and the rise of actresses. Male actors originally played all of the female roles in wenmingxi, as they generally had in shinpa. Mixed-gender performance came about because of a personal disagreement, when New People Society actor Su Shichi missed an entrance, prompting his fellow troupe-mates to ostracize him. He left to form his own troupe, and while he was able to lure stars of male roles, he could not secure any successful performers of female roles. As a result, he resorted to using female performers. Though Liu does refer to several gender theorists in this section, the reality is that this first stage in mixed-gender casting failed to spread, not for any theoretical reason, but for the practical reason that the male performers of female roles were already well established and female performers were not needed. An added highlight of this chapter, for those interested in Japanese theater, is Liu’s discussion of shinpa’s first and only female star, Kawakami Sadayakko, as well as her male competition in the early days of Japan’s modern theater. In his Epilogue, Liu gives a brief but compelling argument as to why wenmingxi and the multiple hybridities it fostered are so important for understanding the later successes and shortcomings ofhuaju. Liu points out how, during the most commercially successful period in the history of huaju—at the height of the War of Resistance—many of wenmingxi’s hybrid strategies reemerged, such as adaptations of foreign plays, appropriating indigenous dramatic elements like operatic arias, and adapting melodramatic stories from popular novels. As an example, Liu analyzes Qiu Haitang, the longest-running huaju during the war. This melodramatic story about a jingju actor included several show-stopping arias, a fact that novelist Eileen Chang at the time described as “humiliating,” but which Liu sees as indicative of the enduring power of hybridity (181). Liu concludes his analysis with contemporary performer and audience statistics for huaju, statistics that demonstrate the current low popularity of this spoken theater form, as compared with the local operatic forms as a group. To bring huaju to great heights again, perhaps the form should look to the hybridities developed by the long-overlooked wenmingxi that Liu brings to the forefront in his impeccably researched volume. Siyuan Liu’s resurrection of wenmingxi demonstrates the importance of hybridity as an analytical framework in the study of Chinese theater from the late nineteenth century onward. The emergence of modern Chinese theater was not a sudden break from tradition, but instead an ongoing interplay between multiple sources and approaches. Both in its findings and methodology,Performing Hybridity repeatedly demonstrates how crucial Japan was in the formation of modern Chinese theater. Numerous Western plays reached China not in their original forms, but via the adaptations already made by playwrights and actors of shinpa. Performing Hybridity dedicates considerable space to discussing Japanese productions; without that knowledge, the development of theater in China cannot be adequately understood. Liu’s copious use of Japanese sources is the methodological element that distinguishes this book from the norm in the Chinese theater field. For example, his analysis of Black Slave’s Cry to Heaven, based on the production photos, promotional posters, and written scenarios located in Japan, is truly eye-opening. So, too, are the many analyses of specific wenmingxi that appear within this volume, as well as the production photos from both Chinese and Japanese productions. Through his meticulous research in Chinese, Japanese, and Western language materials, Liu reconstructs a wenmingxi that was as deliberately and thoughtfully created as its more studied successor, huaju.